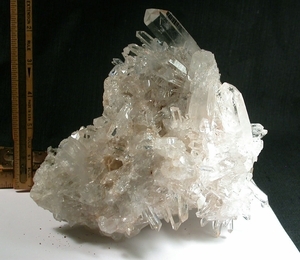 Brilliant, absolutely A+ grade gem clear Arkansas quartz cluster exhuberantly splayed over cryptocrystalline casts [after calcite] and seashell-like back - with a few chert inclusions. Still fresh enough to disperse its' natural clay crumbs. 7x 7x 4" deep, and self-dsplaying. Largest are 3/4x 2-3/4" twins. Several crystals have uncommon 7h faces. Many penetrated crystals, many more rainbows. Chains of small clear crystals over the 'matrix' ribbing, too! No mining damage: however, natural damage gives you a very adjusted price for a true show-stopper. Email us if you'd like to see more photos. Sent doubly-boxed in soap powder for protection. We'll enclose our hangtag with handwritten description as always.